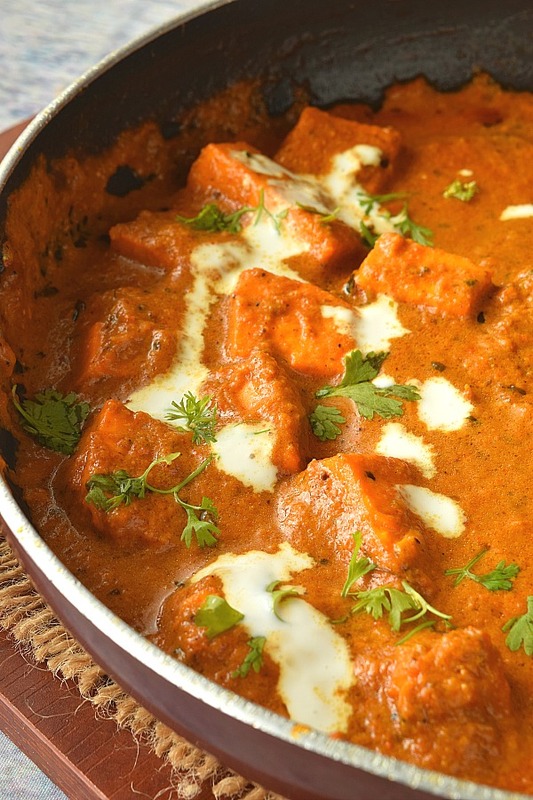 Restaurant style creamy ,delicious Paneer Makhani /Paneer Butter Masala works so well as a vegetarian option to enjoy the similar taste of that of Butter Chicken! Enjoy this gravy with Naan /Roti/Paratha or rice. 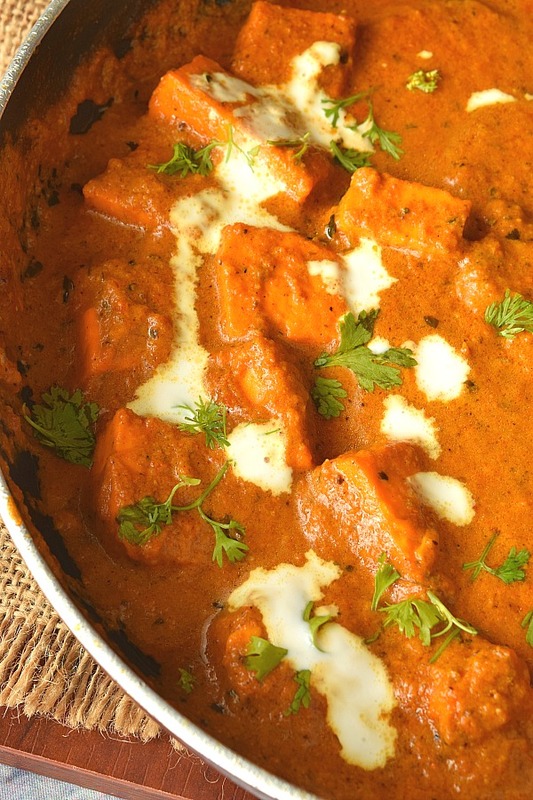 One of the most loved vegetarian dishes...Paneer Butter Masala!! This is one of my favorite Paneer dishes...apart from this I prepare Palak Paneer, Paneer Bhurji, Paneer Kadai, Paneer Tikka Masala, Paneer Pakodas..will post recipes soon!! You can check my recipe of Palak Paneer and Paneer Chilli Dry too!! Do try this recipe and enjoy!! 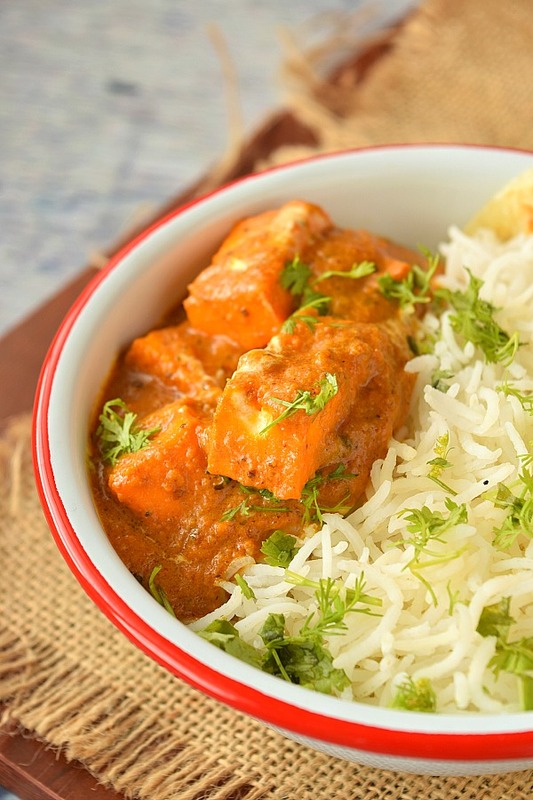 Restaurant style,creamy delicious Paneer Butter Masala or Paneer Makhani,goes so well with Naan/Roti or Rice! In a pan,add butter and oil together,and heat it. When hot,add cashew nuts and onion. Fry them till soft and brown. when cooled grind it to a smooth thick paste by adding very little water. Meanwhile,in a mixer grinder,add all the ingredients mentioned "For Masala" except cilantro,cream and water. Pulse it once to make a coarse powder. Add cilantro and cream and grind it to a smooth paste. If required add water to it. In the same pan, add the kasoori methi and let it cook in the leftover juice of fried onion. Next add the masala paste and let it cook. Add salt and sugar,add the onion paste. Add tomato puree and mix further. Optionally add garam masala powder and pinch of food color ,cream and mix well. Let this cook till oil starts to separate,add paneer cubes and mix slowly. Add chopped cilantro and serve immediately Roti /Naan /Paratha or Rice. 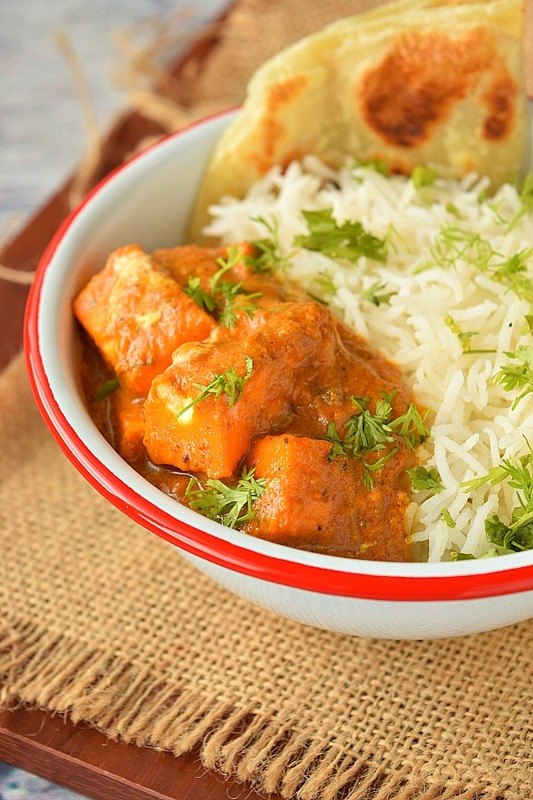 Its always better to keep paneer cubed and soaked in warm water, this way paneer is very soft when cooking. For tomato puree, you can use store bought puree or prepare at home. Fry the onions till they are brown and then cool them and grind to a smooth paste. Do not make it watery. Adjust the spice levels as per your choice. If you liked my recipe the do not forget to save it.